WHAT DO FOOTBALL COACHES WANT FROM SPORT SCIENCE? Sport science can contribute to the body of knowledge that influences practice and performance. Despite this, knowledge transfer from sport science to football coaches needs further improvement. The present study’s purpose is to gain insight in current sport science needs and perceived barriers among professional football coaches. A 20 questions digital survey was sent to a database of professional football coaches. Answering options were: check boxes, open fields, and 5-point Likert scales. 75 football coaches (mean ± SD age: 50.0±10.1 years) completed the survey. Coaches had 24.3±7.0 years of experience as a player and 25.5±13.7 years as a coach, and five had a university degree. The coaches evaluated their technical and tactical knowledge as good. Knowledge on physical skills was rated slightly lower and knowledge on mental skills lowest, but still fair. Top five of domains that the coaches wanted to know more were Mental skills, Physical skills, Group dynamics, Monitoring load and capacity, and Talent development. The top 5 perceived barriers for using sport science in daily football practice was Conservatism in clubs, Lack of money, Lack of specific football knowledge of scientists, Poor applicability of sports science in practice, and Lack of time. Personal contact with sport scientists was most preferred to gain knowledge in sport science. Results suggest that there is an interest in applying sport scientific knowledge into football practice. An overview of coaches’ sport science knowledge gaps and perceived implementation barriers could improve the integration of sport science and practical knowledge in work environments. At Faculty of Kinesiology we recognize that access to quality research is vital to the scientific community and beyond. 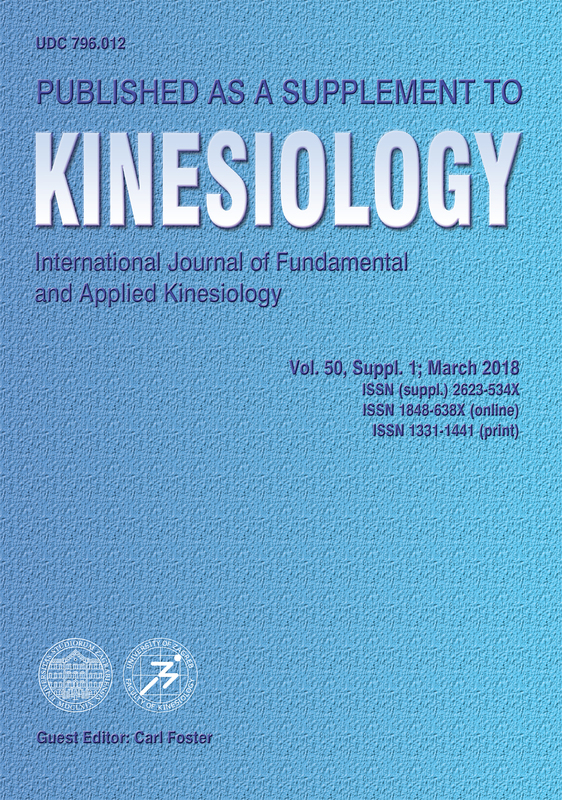 Kinesiology is non-profit journal and all costs of publishing and peer review process are covered by the publisher itself or other funding sources like Ministry of Science and Education of the Republic of Croatia. Full text papers are also available free of charge at http://hrcak.srce.hr/kineziologija. There are no restrictions on self archiving of any form of paper (preprint, postprint and publisher's version). Kinesiology does not charge any fees to authors to submit or publish articles in our journal.